They have been around for quite a while. I am always late in discovering delicious music like this. When I heard this song for the first time today I had to run to my drawing pad. In between dancing I draw the frog. I have also listened to The Murders in the Rue Morgue – Read by Bill Nighy. I wish I could hear Bill say “Loge du concierge” 24 hours a day. Yes I love his hat. But his message was really more important. I hope it didn’t snow under in the hat talk. Here’s the song. Clean the room. Start dancing. Was this the really the best I could come up with for a post? 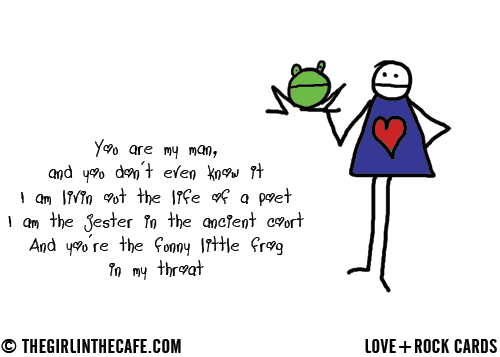 But you’re the funny little frog in my throat. Oh Ingrid … this is a great song. I’ll listen to it again tomorrow and clean. I’m too tired tonight. Bill’s message is important and I like the way he gets it across in his usual under-stated manner. I love your frog drawing! I really love that song too, it is very addicting! Belle and Sebastian they are called.